The old Wyndham Street showroom of The Imix Club, opposite to the historic Central Police Station of Hong Kong, provides a pure space for the display of both simple lined and Ming style Chinese furniture. 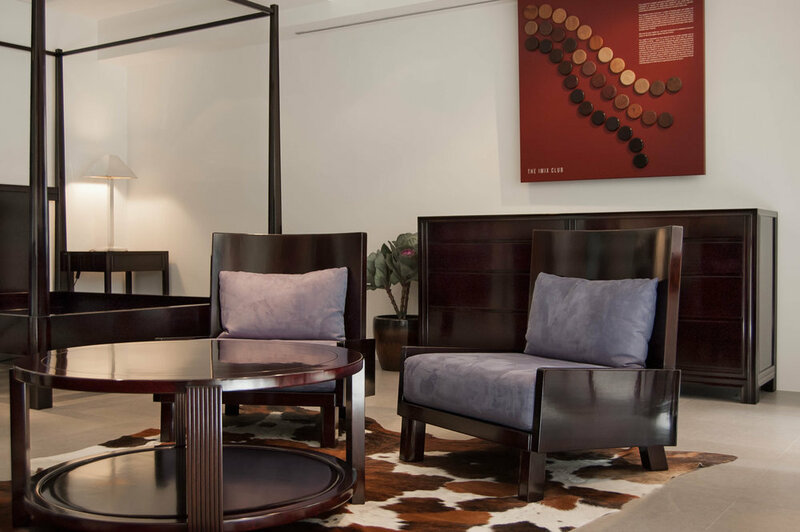 Our old Wyndham Street showroom, opposite to the historic Central Police Station of Hong Kong, provides a pure space for the display of both simple lined and Ming style Chinese furniture. Built in 2007, it coincided with our increased emphasis on streamlined geometry on some of our then newly designed furniture. The bedroom display shows well how furniture, all with various unfussy design elements, can work cohesively to a wholesome and noble effect - even with scant soft furnishings and other decorative objects. Shown in the foreground is coffee table LT 29, while canopy bed BD 10 is on the left. The dresser, CA 56, is a textbook example of how Ming furniture spirit best informs a modern piece of furniture. Observe the attractive contrast between the glow of light in the concave moulding and the drawer surfaces showing subtle wood grain character. The curved back lounge chair, CH 29, has a back that is arguably its best face. Old school and meticulous hand crafting pays off in the most inobvious way. Rather than using authentic Natural Lacquer, we use a combination of shellac and wax oil to achieve the natural finish effect for TA 64 dining table. Its top surface allows an expansive display of the figures of solid Cambodian Rosewood boards. 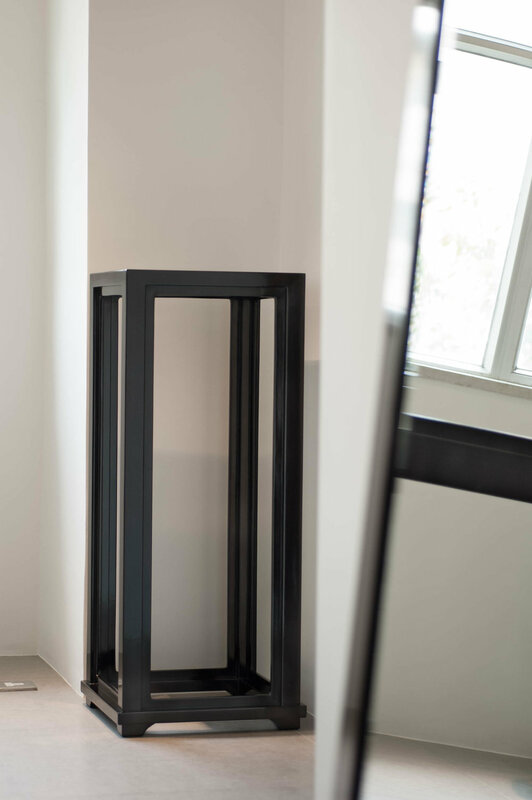 The highlight of this piece is in its hidden construction for the table top - Ming furniture architecture concealed under a clean and modern exterior. It is quite possibly the most ingenious structure for a modern dining table top. The base of TA 64 is simple in look, but not simple in its design considerations. How it looks is only one of many considerations. The living space display is a juxtaposition of pieces with varying moods, but again to pleasing effect. Most prominent is SH 4 shelf. We designed the round corner console table, Table 54, based on the ubiquitous Ming style round corner single slab console table. Above the table is hung a black and white photo of the front post of Cabinet 56. The complexity of just a piece of wooden member is enormous. Consider how these factors shape its crafting - the concave mouldings, concave edges, groove for side panels, top slanting angles made for the slotting in of horizontal frames, joints for the attachment of side braces, and finally the multiple vertical tongues to be inserted into the underside of the top frame. The sun bathed study zone is shown with casual elegance - not the least of which by the oversized and meticulously crafted mirror, AC 5. SD 2, Ming style square corner flower stand, may be used just for its own sake. CH 11 takes the form of classic Ming style south official's hat armchair. Splat is with peony relief carving, and rattan seat is supported by woven palm string web support at the bottom. Come up close to appreciate the finely finished armrest, with authentic Natural Lacquer and endless cycles of sanding and polishing.